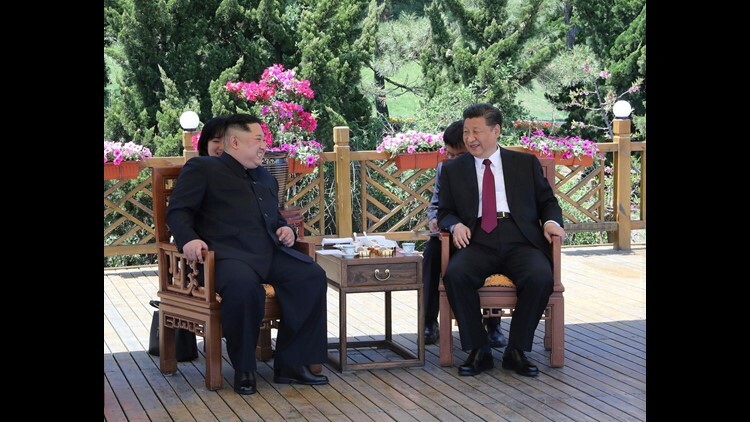 BEIJING (AP) — North Korean leader Kim Jong Un met with Chinese President Xi Jinping in a northern Chinese port city and pledged his continuing commitment to denuclearization ahead of his expected summit with U.S. President Donald Trump, state media said Tuesday. The meeting Monday and Tuesday in Dalian is the second between Xi and Kim in recent weeks, following Kim's March visit to Beijing — his first since taking power six years ago. In comments carried Tuesday night by Chinese state media, neither leader was quoted as directly referring to either the planned Trump meeting or Kim's summit with South Korean President Moon Jae-in late last month. However, state broadcaster CCTV quoted Xi as saying China "supports North Korea to stick to denuclearization of the Korean Peninsula and supports North Korea and the U.S. in solving the peninsula issue through dialogue and consultation." Trump tweeted Tuesday that he planned to speak with Xi later in the day to discuss trade and North Korea, where he said "relationships and trust are building." Kim was quoted as telling Xi that North Korea remains committed to denuclearization and has no need to possess nuclear weapons if a "relevant party" drops its "hostile policy and security threats" against it, a clear reference to the United States. "I hope to build mutual trust with the U.S. through dialogue," Kim was quoted as saying. A political resolution of tensions on the peninsula and denuclearization should proceed in stages, with all sides moving in concert, he said. The Trump administration has demanded that North Korea immediately commit to denuclearization. Kim was accompanied by his younger sister, who has taken on an increasingly public role as the North Korean leader has tried to present a "softer" face to the outside world. North Korea's official Korean Central News Agency said there was a "deep exchange of opinions" between Kim and Xi on the changes around the Korean Peninsula that are "drawing the world's eyes and ears." Kim offered his views on how North Korea and China would "firmly grasp the strategic opportunity," it said. Though rumors are likely widespread, North Korea's media still have not explicitly confirmed the expected summit with Trump. The recent South Korean summit and the potential U.S. talks have received more attention internationally, but China's role as an economic lifeline for North Korea makes the talks between Xi and Kim all the more crucial. Kim needs to make sure that whatever negotiations he has with Trump align to some degree with Beijing's positions, which could certainly complicate his task ahead. China's official Xinhua News Agency said Xi hosted a welcome banquet for Kim on Monday and the two leaders strolled along the coastline at a government guesthouse and had lunch together on Tuesday. "At a crucial time when the regional situation is developing rapidly, Kim said he came to China again to meet with (Xi) and inform him of the situation," Xinhua said. "In a cordial and friendly atmosphere, the top leaders of the two parties and the two countries had an all-round and in-depth exchange of views on China-DPRK relations and major issues of common concern," Xinhua said, using the initials for North Korea's official name, the Democratic People's Republic of Korea.